Some of America’s leading public intellectuals, scholars and activists gathered at Tufts University April 16-18 for the fifth annual Barack Obama and American Democracy conference. Michael Eric Dyson’s exhilarating opening keynote offered a rich intellectual and political framework for principled criticism of the Obama administration’s political and moral failures with a balanced appreciation of the president’s special relationship with the black community. The next two days featured an assortment of panels that critically analyzed the pursuit of radical democracy in the age of Obama and current racial, economic and health disparities, as well as evening keynotes by Massachusetts Institute of Technology computer science professor Fox Harrell on race and digital media, and by Boston University sociologist Ruha Benjamin on race, crime and punishment in the 21st century. Political change begins in your own backyard. Boston NAACP President Michael Curry and Barbara Dougan, the Massachusetts project director of Families Against Maximum Minimums, each spoke passionately about their local efforts to transform the criminal-justice system at the neighborhood level. 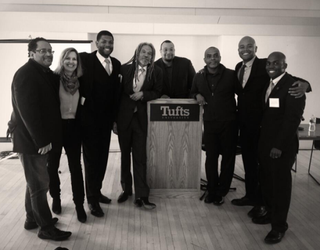 Curry has helped revitalize the city’s once moribund NAACP chapter by focusing creative, innovative education and outreach efforts on troubled communities in Dorchester, Roxbury and Mattapan in order to offer new avenues of opportunity and citizenship for poor black and Latino youths. Dougan’s nonpartisan group boasts more than 3,000 local members, including the families of the incarcerated and ex-convicts advocating for an end to harsh sentences for nonviolent drug offenders. Ending mass incarceration will require robust political activism at the local and state levels to amplify the federal government’s recent commitments to more equitable criminal justice in America. The Obama administration’s most important legacy will be at the policy level. One of the conference’s most riveting panels featured legal scholar Jeremy Levitt, political scientist Ricky Jones and historian Jeremi Suri, all of whom examined the real-world impact of Obama’s policies at the local, national and global levels. Jones emphasized the need for policy at the municipal level to alleviate poverty, unemployment, youth violence and health care. Levitt offered some of the conference’s most stinging and provocative criticism of Obama’s foreign policy decisions, noting that the State Department featured “neoconservatives dressed up as progressives” whose failures in North Africa, the Middle East and elsewhere had set America back in the area of international human-rights advocacy. Suri complicated this analysis by asserting that Obama’s shortcomings related to his inability to manage political and administrative bureaucrats toward clearly articulated policy agendas and goals. Finally, all of the panels and keynotes stressed how young people can transform the world in our own time. Journalists and social media activists Zerlina Maxwell, Aura Bogado and Phillip Martin highlighted the ways in which a combination of Twitter and old-fashioned door-to-door organizing held the key to social movements both during and after the Obama presidency. They noted how Trayvon Martin’s slaying highlighted the possibilities and limits of social activism because although it galvanized national action, that action has subsequently been hard to harness and duplicate. Sociologist Ruha Benjamin, author of the groundbreaking People’s Science: Bodies and Rights on the Stem Cell Frontier, provided a brilliantly throught-provoking bookend to Dyson’s opening keynote. Her talk, “I Have a Nightmare: Life, Liberty, and the Pursuit of Punishment,” provided historical context and rich sociological data to underscore the depth of unequal justice in America. But the talk ultimately proved inspirational in its recognition that young people’s activism could, in our lifetimes, transform the status quo just as it did over a half-century ago when groups of sit-in demonstrators and Freedom Riders risked jail and put their bodies on the line to create a more just nation. Ultimately, the Barack Obama and American Democracy conference offered moments that were—at times simultaneously—heartbreaking and inspiring, invigorating and wrenching. At the nexus of hope and cynicism is a real-world pragmatism that relies on the faith of our ancestors as ballast for our contemporary political moment, a world that both confuses and confounds. This faith, inspired as much by the young as the old, was on display in the faces of students, activists and scholars who gathered as a community of social-justice advocates determined to pursue a more just world in the age of Obama and long after.